Job 38:1-7 Then the Lord answered Job out of the whirlwind: “Who is this that darkens counsel by words without knowledge? Gird up your loins like a man, I will question you, and you shall declare to me. In his youth, William Blake studied engraving and attended briefly the Royal Academy in London but his art did not reflect the academic teachings of his day. Instead, the art of the Middle Ages and the Renaissance was Blake’s early interest and the influence of other historical sources was minimal. 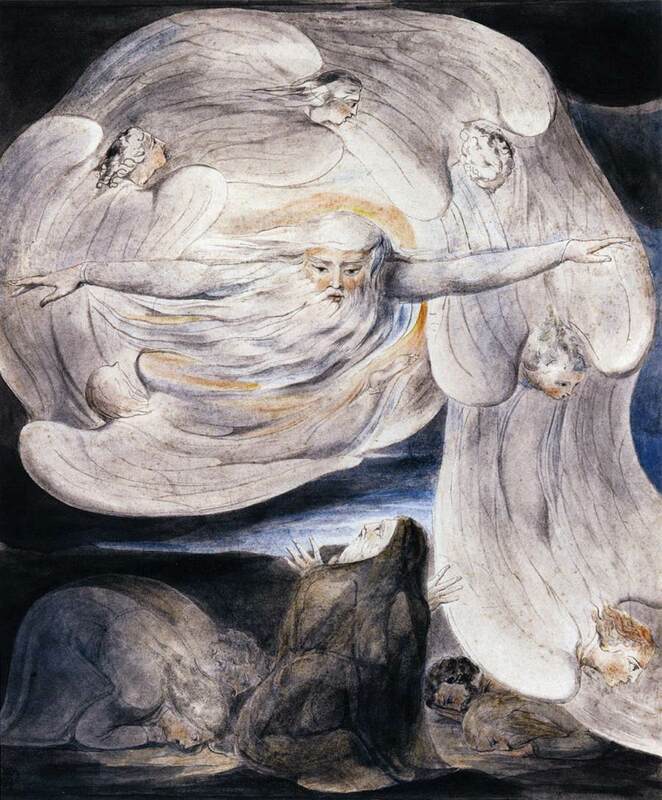 Unlike the landscape paintings of his contemporaries, Blake’s images came from within. He spoke of visits from heavenly beings and his work often is referred to as visionary. Even when we are unsure of what is being depicted, we become engaged usually by his provocative imagery. The setting for the illustration of God answering from the whirlwind is at a time when it seemed nothing more could be done to further the anguish and discomfort of Job. All of his livestock was stolen, his thousands of sheep perished in a fire, a strong wind destroyed his house and killed his ten children, he was covered with sores, and his wife ridiculed him. His friends thought this was all brought on by his sins and advised him to confess. Job insisted adamantly that he had done no wrong and had, in fact, adhered to all of the teachings of God. At this time he had nothing more to lose and demanded answers from God regarding the cause of his losses and suffering. God came to him and spoke from a whirlwind. Instead of revealing reasons for the suffering endured by Job, however, God responded with profound questions on subjects ranging from the marvels of the creation to the wonderment of the earth and the heavens. As God brought attention to these things, Job came to realize how little he understood of the infinite differences between God’s realm and his. After God spoke, Job’s health, possessions, and family were restored. Blake admired the work of Michelangelo and, in “Job Confessing,” a bearded God has similarities to the image of God in the Sistine Chapel’s “Creation of Adam.” Blake’s image, however, is lighter and much less physical in its appearance. There is a dream-like effect in the whirlwind that is formed by angels swirling around God and swooping down as they speed past Job and go on to move across the land. Job is kneeling and looking up with fingers spread in a state of awe. His wife and friends are overwhelmed and frightened as they bow down on the ground near him. During the late eighteenth and early nineteenth century there was a reaction to the impersonal intellectualism that tended to be part of neoclassicism. To the romanticists, feelings were important and their work often was imbued with emotional and dramatic content. Although Blake’s work was not part of the mainstream of art, it was part of the romantic tendencies of his time. The Book of Job was of longstanding interest to Blake and he returned to it regularly. Twenty years after creating, “Job Confessing His Presumption to God who Answers from the Whirlwind,” he again took up the theme and made twenty-two illustrations on subjects based solely on the Book of Job. Blake was not only a visual artist he also was a very gifted poet and writer. His poems, such as The Tiger, [“Tiger, tiger burning bright, in the forest of the night…”] are widely known.